Let’s face it. Dental hygiene isn’t exactly the most fun thing out there, especially for little kids. So after chasing them around the house armed with a tooth brush, and perhaps a scolding or two, what’s the new strategy? Resorting to horror stories about icky bite-sized monsters who like to dig holes in ‘mouth caves’, and eventually establish their own ‘Mouthidom’? Nah. Shondicon presents a much faster and easier way: Brusheez - an interactive, educational app that’ll make brushing their teeth the new ‘in thing’ for kids. 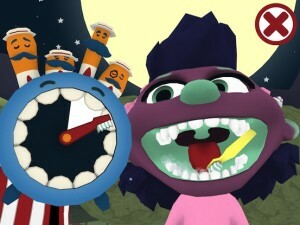 It features two monsters, Zookie (girl) and Kazowie(boy) who unlike the ‘Mouthidom’ minions actually enjoy brushing their teeth and not eating through other people’s teeth. You can poke their noses, tickle them in their tummies, spin them around to make them dizzy, make them jump, customize their looks, get a close-up of their mouths, play a drum of sorts on their teeth, and even tailor their smiles by choosing how many teeth they have! You can only have one monster at a time. They can easily be switched by tapping the flag on the tent on the left side of the screen. Now for the best part. 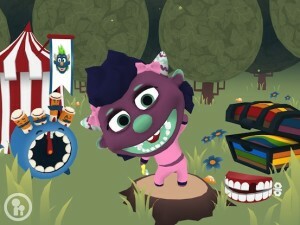 By tapping the four-headed blue clock, you can set a timer, for the duration of which your chosen monster brushes his/her teeth whilst dancing to a foot-tapping song, which is obviously about dental care. Want to make your kids brush their teeth for one whole minute? Simply set the timer and have Zookie or Kazowie accompany them! 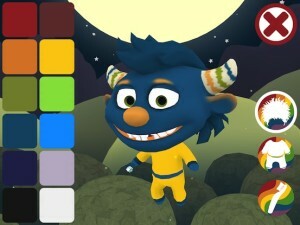 No wonder the app description refers to them as monster pals! Shondicon has included a really good walk-through for the app. 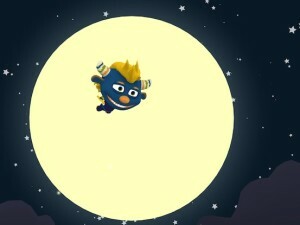 This can be accessed by tapping the small circular icon on the bottom left of the screen. Wheehoo! Up and over the moon!